This golf hypnosis CD package is a comprehensive golf training aid for the mental side of your golf game, and it’s EASY!. Just sit back and enjoy the journey, as you strengthen your most important golf muscle. This is golf instruction for potentially the most important part of your game – the mental game. Tap into the power of your biggest and most important muscle when playing golf. Your brain! This complete golf instruction package – Tapping Into Your Inner Tiger, is a comprehensive golf training aid for the mental side of your golf game. It delivers proven performance improvement with golf instruction. The package offers a complete set of the Tapping Into Your Inner Tiger series. Allowing you to focus on the area of your golf game that needs it most at any given time. Putting, consistency and control means sinking more putts more often. This is golfing instruction for potentially the most important part of your game – the mental game. Feel more in control of your golf swing and those putting greens. Quite possibly the easiest and most relaxing golf training aid on the market. Through this series of hypnosis recordings you’ll be flexing your brain muscle in the most enjoyable way. I’m just back from England and Scotland after winning the trophy for the tour!!!! Just a short note to say thanks! Picture taken out the back of Royal St. Georges golf course. 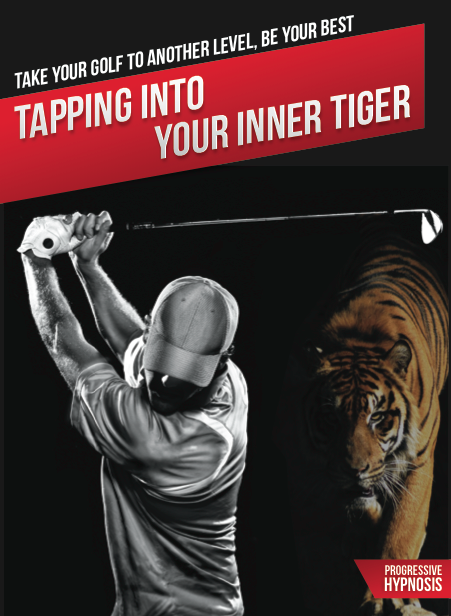 This proven golfing performance improvement package offers a complete set of the Tapping You’re your Inner Tiger series allowing you to focus on the area of your game that needs it most at any given time. Just sit back and enjoy the journey, as you strengthen your most important golf muscle.